We believe in the power of the Word of God to bring about transformation. This excerpt is taken from our vision statement[PDF]: “As individuals have a true encounter with the Word of God, applied to their context, their lives will change. We seek to provide this encounter for all those who live in or visit the Yucatan.” This past month we’ve seen opportunities to lead people into just this type of encounter. Things began with a report from Ricardo Rodriguez, who had received the blessing of literature that we were able to coordinate in January of this year. He shouted an enthusiastic “Glory to God,” as he related the results of the campaigns that took place throughout the state of Yucatan. It was a pleasure for us to see the Bibles that they were able to purchase being grasped firmly by new believers now preparing themselves to confirm their new life by following the Lord in baptism. 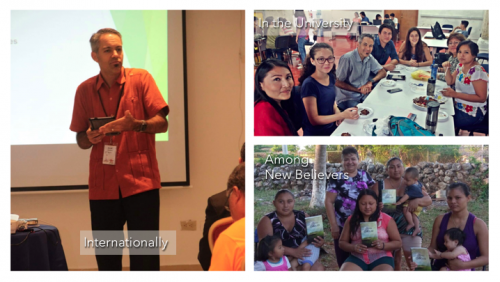 The blessings continued internationally as, from April 18-21, Dave had the chance to travel to Panama, where several hundred educators had gathered for fellowship, spiritual enrichment, and continuing education. For two sessions, he teamed up with fellow missionary Paul Kazim to teach the course “The Teacher and Biblical Interpretation.” It was a joy to be able to lead the participative groups into the discovery of tools that will not only facilitate a personal encounter with God’s Word, but also help them to correctly guide others into the same experience. As we wrapped up the month, we were excited to see how the Bible studies, which were reinvigorated by the Chi Alpha Team visit in March, are having an impact on the students attending the University of Yucatan. During one session, a new student chose to listen in on the conversation even though he admitted to being an atheist. In another meeting, Fernanda* was clearly moved as we talked about how God gives us comfort in our need so that we might offer that comfort to others. Following up with her, we found out that word had given her the courage to reconcile her strained relationship with her mother. Clearly, God’s Word has power! Thank you then for your support as we continue to offer opportunities for others to experience God’s Word. And, as you thank God for His work, won’t you pray for these new believers, educators, and university students, that these encounters with God’s Word will continue to produce fruit in their lives?